I want you to imagine for a minute that you have been selected for jury duty, and you are sitting in the courtroom listening to the evidence. As you watch, the prosecution calls an expert forensic scientist to the stand, and they carefully explain the facts concerning the forensic evidence, all of which point towards the defendant’s guilt. Then, the defendant’s lawyer stands up and shouts, “Objection, this witness has been paid off to lie about my client!” After a moment of shocked silence, the judge says, “That is quite a claim. What evidence do you have to support it?” The lawyer then responds simply by saying, “only someone who had been bought off would say things like that against my client.” Now, what do you think is going to happen next? Is that a reasonable defense that the judge will accept? Obviously not! The defense is making an extraordinary assumption, and it is clearly invalid to do so. In an example like that, the problem is obvious. You can’t just make things up to dismiss facts that are inconvenient for you. Indeed, when a person’s fate hangs in the balance, we all want the arguments and evidence to be based on facts, not assumptions. Nevertheless, when it comes to science and many aspects of our daily lives (such as politics), people are often more than happy to accept assumptions, and people frequently state them as if they are facts. Therefore, I am going to provide several examples of this flawed line of reasoning, and explain why it not only doesn’t work, but often commits a logical fallacy. The first example is probably the most common one that I encounter, and it is highly analogous to my courtroom example. I recently engaged in a Facebook debate with someone who made the bold claim that there is no empirical evidence for climate change. I responded to that assertion by providing him with multiple papers that did in fact provide empirical evidence for climate change. How do you think he responded? You probably guessed it. He simply claimed that all of the scientists involved in those studies had been paid off (just like my fictional lawyer did). That argument was clearly fallacious in my courtroom example, and it is equally flawed here. You can’t just assume that scientists have been paid off any time that they publish a result that you don’t like. You have to provide actual evidence of corruption, otherwise you are making a baseless assumption. In fact, journals actually require scientists to declare any conflicts of interests, and failure to do so is a serious offense (it can result in loss of funding, papers being retracted, etc.). So there is no need to make assumptions about conflicts of interest, because you can easily check and see if they exist. Nevertheless, this is one of the most common arguments among those who reject the results of modern science, and I constantly encounter it among anti-vaccers, those who oppose GMOs, climate change deniers, people who use alternative medicine and/or reject modern medicine, etc. 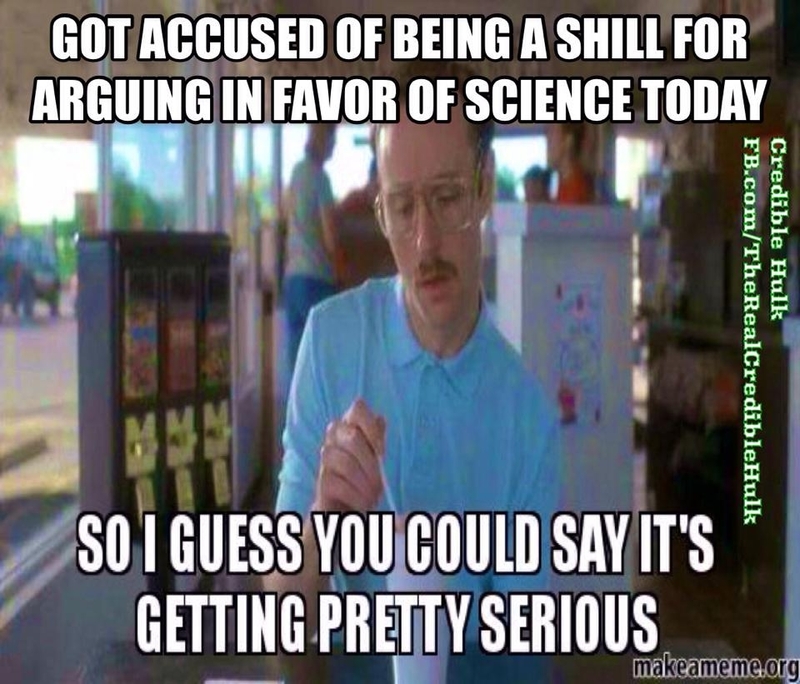 A very closely related line of attack is simply to accuse the person that you are debating of being a shill, astroturfer, etc. Indeed, I constantly have to deal with people accusing me of having been bought off by big pharma, Monsanto, the government, lizard people, etc. In every case, however, it is a complete assumption (and a faulty one, as I actually pay money out of my own pocket to maintain this blog). You can’t just go around assuming that everyone who disagrees with you has been bought off. That’s not rational. I could continue giving copious examples of this type of reasoning (e.g. assuming that “big pharma” has bought of the FDA and CDC), but I think that you get the basic picture, so I want to move on to explaining a bit more about why this type of argument is invalid. There are actually two logically fallacies being committed here. First, all of the specific examples that I have given so far commit a genetic fallacy (sometimes specifically an ad hominem fallacy). This fallacy occurs when you make an irrelevant or unjustified attack against the source of the information, rather than addressing the information itself (even a flawed source can sometimes be correct). I have previously talked about this fallacy at length (see previous hyperlinks), so I want to focus instead on the second fallacy. This one is more general and can occur even when a source is not being attacked. It is what is known as an ad hoc fallacy. It generally occurs as a response to an argument, rather than an argument itself, and it has the defining characteristic of proposing a solution that you would never accept unless you were already convinced of the claim that was being defended. In other words, an ad hoc fallacy is a response that is not based on evidence and whose sole purpose is to “solve” a problem in an argument that you are fond of. That may have seemed a bit complicated, so let me explain by applying it to one of the examples that I used previously. In the example of the climate change denier, his claim was that there is no empirical evidence of climate change (that is the position that he was defending). I presented him with empirical evidence, thus clearly contradicting his claim. He then responded to that evidence by asserting that all of those scientists were really paid shills. However, there is no evidence to support that assertion, and there is no reason to think that the assertion is true other than a desire to believe the initial claim. So he was simply assuming that the scientists had been paid off, even though he had no evidence to support that claim. Do you see how this works? It is an assumption that is stated as if it is a fact, but there is no actual reason to think that the assumption is true. It serves no function other than patching the hole in the argument, and you wouldn’t accept it unless you were already convinced that the initial claim was true. Nevertheless, not all assumptions are ad hoc fallacies, but that doesn’t make them any less flawed when they are used in debates. You simply cannot state assumptions as if they are facts. The hidden cancer cure conspiracies provide a great example of these, because they involve assumptions stacked on other assumptions. In order to argue that pharmaceutical companies are hiding a cure for cancer, first have to assume that a cure actually exists, but that is a meritless assumption. Can you provide me with actual evidence that pharmaceutical companies have a cure hidden on their shelves? No, you can’t, which means that you don’t get to state the claim that they have a cure as if that claim is an evidence-based fact. Similarly, you also have to assume a rather large conspiracy in which everyone involved is willing to sit back and watch their friends and family members die. This conspiracy would have to involve not just the CEOs of companies, but also people on the ethics committee who approved the research, people in the FDA who approve the trials, accountants who handled the budgets, lab techs, the scientists themselves, etc. That’s an awful lot of people to be involved, and you cannot just go around inventing conspiracies like that without providing actual hard evidence of their existence. This conspiracy theory (and the vast majority of conspiracy theories) relies heavily on unsubstantiated assumptions, which is a big part of why it is irrational (they are also often ad hoc). Indeed, if it was permissible to substitute assumptions for facts, then we could all do this anytime that we wanted. I could, for example, claim that smoking actually has health benefits, and the tobacco industry scientists were actually correct about the safety of cigarettes, but big pharma paid off a ton of scientists to falsify data showing that cigarettes were dangerous because big pharma wanted to profit off of sick people. Now, you probably think, “that’s ridiculous!” and indeed it is, but it is no more ridiculous than claiming that pharmaceutical companies paid off scientists to falsify information on vaccines, or claiming that marijuana is only illegal because legalizing it would hurt pharmaceutical companies, or claiming that climate scientists are falsifying data, or claiming that Monsanto controls the world’s agriculture scientists, etc. All of these are baseless assumptions, and you cannot present them as if they are facts. As I approach the end of this post, I want to remind everyone of one of the most important concepts in debates and rational thinking: the burden of proof. This states that the person making the claim is always required to provide legitimate evidence to support it. In other words, if you want to claim that scientists have been paid off, then it is your duty to provide actual evidence to support that claim, and if you cannot do that, then you are stating an assumption, not a fact, and your argument is illegitimate. Similarly, if you want to claim that companies are hiding cures, a conspiracy is afoot, etc., you must provide evidence to substantiate those claims. You simply cannot assume things that haven’t been verified, because if you could, then we could all dismiss every single argument that we don’t like simply by assuming the existence of some contrary evidence. Also, it is worth explicitly stating that you have to show the evidence, not the other way around. In other words, if you are claiming that a conspiracy exists, you have to provide evidence that it exists, whereas I do not have to provide evidence that it doesn’t exist. That’s the way that the burden of proof works. In fact, saying “you can’t prove that it doesn’t exist, therefore it is valid to think that it does exist” is a logical fallacy known as an argument from ignorance. Finally, although I have been speaking specifically in the context of debates, you really should apply this to your own views (regardless of which side of a topic you stand on). Think through your arguments and make sure that you can provide proper evidence from high-quality sources to back up each component of your reasoning. Seek out your assumptions, test them against the evidence, and if they cannot be verified or strongly supported, reject them. Admitting that, “I don’t know” is far, far better than insisting that you do know, when in fact you are simply making an assumption. Note: I fully expect someone to read this and say, “but we use assumptions all of the time in our daily lives and they are useful.” That is true, but it is irrelevant for several reasons. First, the assumptions that we make in our daily lives are very often flawed and frequently get us into trouble. They are, in fact, unreliable, which is why they aren’t valid substitutes for evidence and can’t be used in scientific debates. Second, many of the things in daily life that we often call “assumptions” are actually evidence based conclusions. For example, if my PhD adviser emails me and asks me to meet them in their office at 3:00, I am going to “assume” that they mean 3:00PM, but that is not really an assumption (at least not in the way that I have been using the word in this post). Rather, it is a probabilistic conclusion based on evidence. I say that, because every single time that my adviser has ever asked to meet with me, it has been a meeting during daylight hours. Thus, there is no rational reason to think that they actually meant 3:00AM. Situations like that are clearly extremely different from creating conspiracy theories or assuming corruption just because you don’t like what a scientist published. This entry was posted in Uncategorized and tagged ad hoc fallacies, alternative medicine, anti vaccine arguments, argument from ignorance fallacies, Bad arguments, burden of proof, cancer, conflict of interest, GMOs, logical fallacies. Bookmark the permalink. Thank you for the blog post and illogical example ! In the predecessor of this post, I mentioned several points. I know it is much about other comment person who argued critically, but I want to remind you again regarding your proofs. In your analogy, you mentioned forensic reports, but I would say that the reports themselves have problems. Please read the literature along these lines; I am sure you will get what I mean. I would like to let you inform something about the state-of-the-science and ask you to provide proofs, if you can get. I believe you know that the cloud radiation budget is one of the critical phenomenon for the climate change studies, it is poorly understood. Let me explain you little bit deeper here. Do you accept that more than 60% chemicals in the atmosphere are water-soluble? Do you know these chemicals change the energetics of cloud processes? If you accept these, please show me the evidence that the scientists understood these processes by now and included in the models that are used for the climate studies. If you don’t accept this phenomenon, you need to dig the subject; there are few articles in top journal that YOU feel, such as Nature, for the aqueous chemistry effects on clouds. Finally, I feel that you fall under “logical fallacy” with, unfortunately, your theme of “The Logic of Science”. Time permitting, I will write a longer response later that addresses your challenge, but for now I simply want to point out that you have completely missed the point, and your comment is totally, 100% irrelevant to the topic of this post. The issue is not whether or not the information in the sources is sufficient. Rather, the issue is this one particular line of reasoning that is used to discredit those sources, and that line of reasoning is logically invalid regardless of whether or not the sources are actually sufficient. Take the forensics example, I actually agree that some forensics techniques have serious problems, but that is totally irrelevant to the point of the example. Even IF the scientist was using a technique that is not actually reliable, that does not change the fact that the defense made a logically invalid assumption and committed an ad hoc fallacy. In other words, if the defense had objected on the grounds that the method in question is unreliable, that would have been fine and no fallacy would have been committed. So the problem is the reason for the objection, not the objection itself. Similarly, even IF the evidence for climate change actually isn’t sufficient, that doesn’t change the fact that it is logically invalid to arbitrarily assume that all climate scientists have been bought off. Do you see the point? I am dealing with one particular line of reasoning, not the entire topics to which that line of reasoning is often applied, and all of my examples do, in fact, illustrate why that line of reasoning is logically invalid. Please ensure that your comments are actually dealing with the specific topic of the post on which you are commenting. My comment looks like it is off the topic, but indirectly it is relevant. I don’t want to talk anything about whether scientists are bought off or not, but the scientists including you are not seeing the actual problems and misguiding the next generation of scientists. This is my intention to argue with you from the beginning. Please check yourself if you are doing it or not; I will also do my part myself. 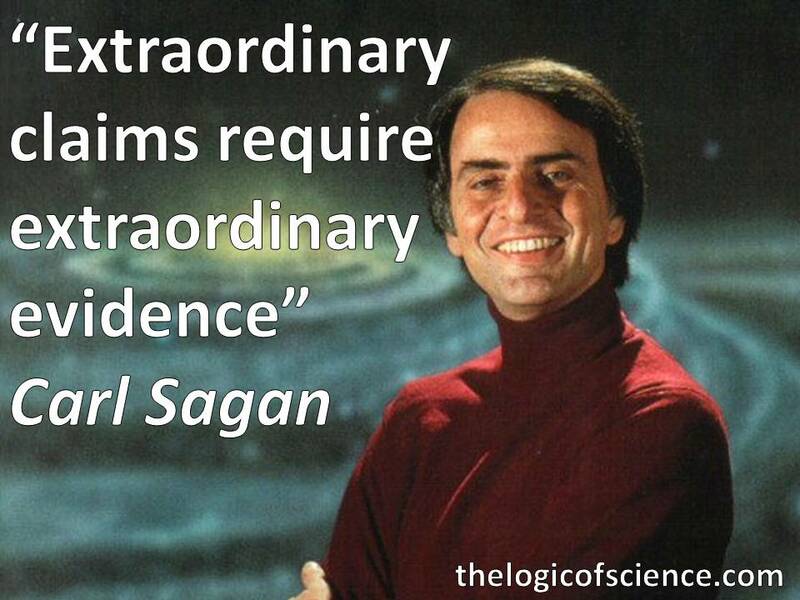 “I believe” because several scientists are saying “is not a logical thing”. The topic of the post is assumptions. Your comment was not even remotely about assumptions. Therefore it was, by definition, off topic. You are talking about an entirely different issue than what this post is about. Regarding your comments on clouds, I will fully admit that there is still uncertainty about how they are going to affect climate change, but there are several important things to note there. First, scientists are working hard to understand the effects of clouds, and many papers have been published on the topic, the consensus of which suggests that it will actually be a positive feedback with greenhouse gasses, rather than a negative one. Again, that conclusion is not certain yet, but it is the way that the research is pointing. IPCC provided a nice review of the literature. Skeptical Science also provided a more condensed overview of the literature. Second, although there are admittedly parts of the climate that we are still trying to understand fully, the climate models have actually done a good job of predicting the observed warming (see the original post that started all of this for the sources https://thelogicofscience.com/2016/10/17/25-myths-and-bad-arguments-about-climate-change/#Bad%20Argument/Myth%20#5). Surely you will agree that the ultimate test of a model is whether or not it makes accurate predictions, and our models are making accurate predictions. Thus, although they certainly still need refinement, it is unlikely that they are entirely wrong. Third, and most importantly, you are once again talking about predictive models which are not what I am basing conclusions on. I am basing conclusions on the studies which examined the warming over the past decades and compared it with both natural and anthropogenic factors, and found that including anthropogenic factors in the models is necessary to explain the current warming. Even without fully understanding all details of how clouds will interact with greenhouse gases, that is very convincing evidence that our emissions are influencing the climate. Similarly, there is the satellite data which you have yet to address. They provide direct evidence that our CO2 is trapping additional heat, and thus influencing the climate. Again, I reiterate that understanding all of the interactions with the clouds is necessary for reliably predicting future changes, but the satellite data are quite sufficient for showing that we are currently influencing the climate, which is all that I have been arguing from the very start.